Directer Joel Grey delivers a rare and rich revival. 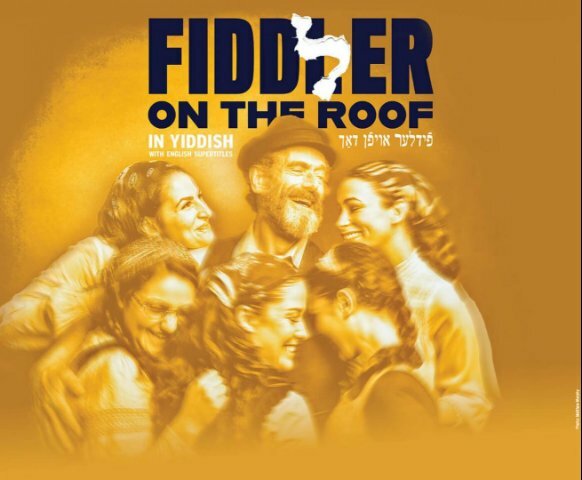 Fiddler on the Roof has come back as a comment and conversation in Yiddish about a time and place that indeed did shake the world. Without the heavy scenery that 'time pieces' often require for our recognition, costume designer, Ann-Hould Ward truly supports a production that frames the language and context of its originator-- Sholem Aleichem as adapted by Joseph Stein. Translator, Shagra Friedman did an admirable job of keeping the well known phrases from the English language production, and yet interweaving Yiddish expressions and points of reference. The subtitle design (Mathew Didner) both in English and Russian, was helpful and creatively presented. Sta? Kmie? (Musical staging/new choreography) utilizes the more open staging to great effect. The dream sequence in which Teveye finds a way to tell his wife that their daughter's marriage to the butcher has been canceled is a beautifully crafted. The little town of Anatevka, its traditions, poverty and isolation is a source of both joy and pain to its inhabitants. Grey allows equal time for both. The humor of mistaking a meeting about the sale of a cow with the arranging the marriage of a daughter to the wealthier 60-year-old butcher, is poignantly off-set by the anguish of the daughter, Tsaytl (Rachel Zatcoff). Ben Liebert, as the impoverished tailor Motl Kamzoyl, is perfect as her not so perfect but much more lovable groom. The matchmaker, Yente, (Jackie Hoffman) as go between is integral to the traditional way of life. A good match is one which the parents arrange. The Rabbi, played with humor by Adam B. Shapiro, oversees the smooth running of daily affairs. The world of the small village in fact has a way to put all things in their proper place. The sweet girlish joy and hope filled expectations of Tevye's adolescent daughters, is confined by the choices which their father will make for them. The traditional vision of women as only mothers, the support and homemakers for men, and the insulation, superstition and ignorance that frames their lives as they seek answers in the wider world is wonderfully wrought by the thoughtful pacing and fine acting. Stefanie Lynn Mason as Hodl and Drew Seigla as Pershik are delightful as they explore the ideas of social and gender equality that are becoming a force in the world outside Anatevka. Khave (Rossie Jo Neddy) the adorable smart daughter finds the world of books and a non-Jewish young man, Fyedke, (Cameron Johnson) with whom she can share it. But these choices are shattering the assumptions not only of their father, but of tradition itself. As Tevye's wife, Golde (Jennifer Babiak) is pained by the destruction of what she knows, and yet remains a source of strength and love to her family. Change comes to the small village, not just in the shift of values but in the horrifying reality of the Tzar's edict of Jewish removal. The villagers must leave, disperse, and adopt new ways of life. Their pain is palpable. And yet there is hope within despair, just as there was pain within their laughter. That vision was the gift of Sholem Alechiem. On his tombstone, which is in Queens, New York, the author's self-crafted epitaph reads in part; "...but exactly when the world is laughing laughing clapping and hitting their lap, he cries, 'Only God knows this secret, so no-one sees'." We can see. The production gives us the window which allows us to. Our take-away is not only a deeper understanding of the world that has shaped the present, but also glimpse of the ways that fiddlers dance precariously as our world changes.